If you believe that learning one new kata after another is the only way you'll advance in rank at your school you're right. You would also be right to conclude that knowing the full canon of kata your system offers as opposed to a few or even none will not make you a better practitioner. Thus, your assertion that kata has survived hitherto is likely due to their usage for promotions and as a handy way to kill class time is further proof of your astuteness. Congratulations, you've been cursed with the capacity for critical thinking. Realize that learning kata just to get your next belt or trophy at the local tournament will not lead to any kind of enlightenment. Neither will churning out hackneyed renditions of kata day after day. Variations (henka) in training methods are key to applying and understanding combative principles. Plus, it's more fun learning that way. Opposite side. This means just what it says. Everything is done as if it were a mirror image. If your form opens with a left middle-block followed by a right reverse punch, switch to a right middle-block followed by a left reverse punch, and so on. 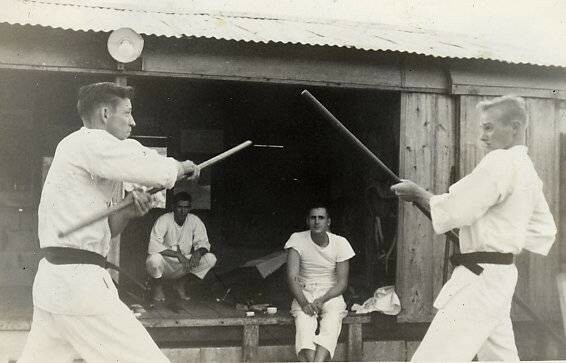 The late Glenn Morris, author of Martial Arts Madness opined that performing opposite side kata will help "open your meridians" or invisible energy channels in your body. For my black belt test (shodan) I was required to know the first five karate kata (of eight) on the opposite side. It was a pain to figure out, and no, I didn't feel my meridians open. High speed. This method makes practical sense. Speed is essential in external styles such as karate. Besides, nobody is going to attack you at tournament kata speed anyway. The trick here is to not make the form look like a train wreck when you're trying to fly through it. Low speed. Perform your kata like a tai chi form. Slowing down the form will bring a heightened awareness to whether you're executing your techniques properly and accurately. Here's an opportunity to take stock of important things like stance-depth and foot alignment which have the propensity to get glossed over during normal sessions of kata training. Defend against attackers. I have heard that kata really began as two-person forms; only later did they become solo exercises. Can you perform your kata in its entirety against the arranged "attacks" found in the form? Performing the kata against two or more choreographed attackers is a great way to demonstrate what the functions of the whole kata is really all about. In Isshinryu karate Bo-bo kumite is a two-person form that simulates what a sparring session could look like featuring a pair of practitioners attacking and defending using 6-foot staffs. With a bit of tweaking this form can be made to look like real combat. These are just a few suggestions to enhance your kata routine. In truth, I've never been a huge fan of kata. Still, I practice them religiously and I probably will as long as I'm able to. Have fun!